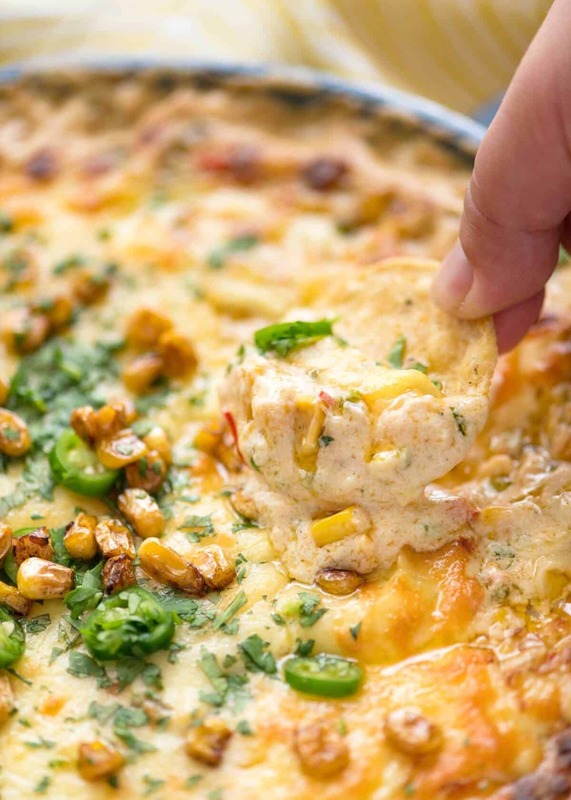 Baked until bubbly, this Hot Corn Dip is Can’t-Stop-Eating-It addictive! 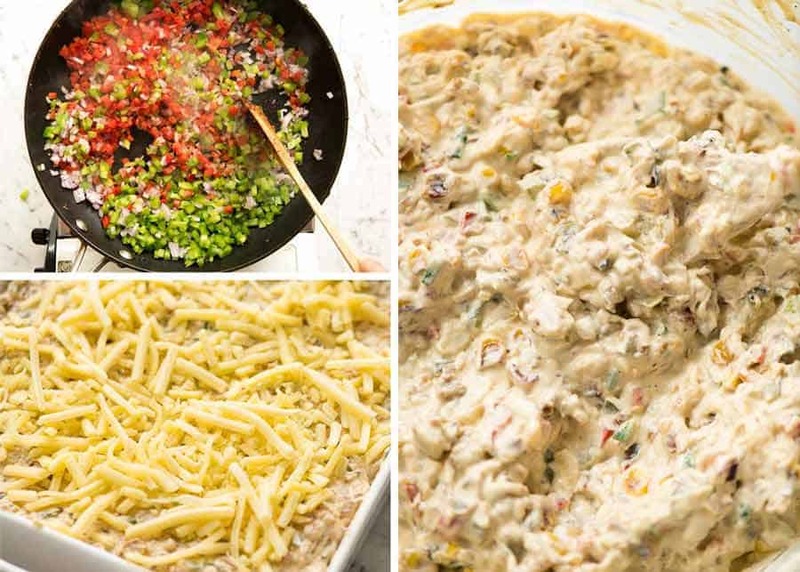 Loaded with terrific flavours and colour, this Corn Dip is made with corn, peppers, garlic, onion, jalapeño, green onions, cream cheese, sour cream and mayonnaise. And my little secret for the best Hot Corn Dip you’ll ever have is to sauté the corn until golden – it makes the flavour extra amazing!! HOT CORN DIP – IN HOT DEMAND! 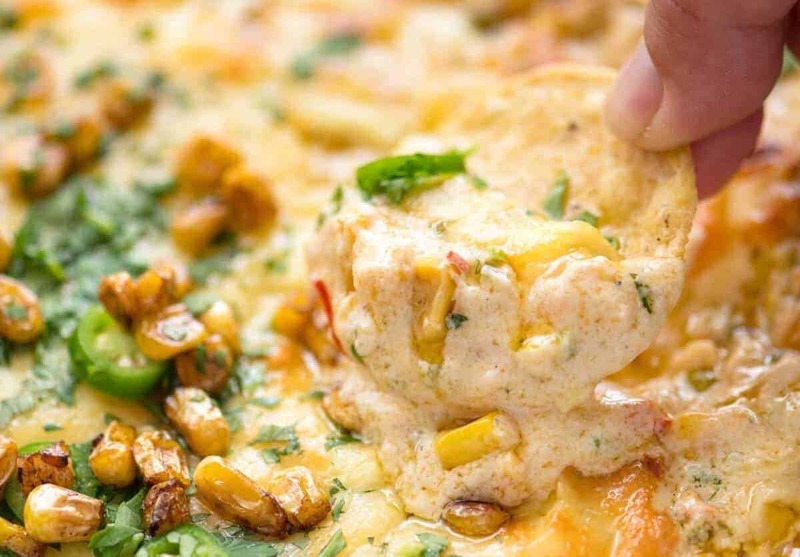 This hot corn dip may well be the highest and best use of corn. It was certainly the first dip to go at a gathering I took this to. I made a double batch and thought there was no chance that it would all go (ok ok, I was secretly hoping) but the dish was scraped clean. I think my friends were subconsciously watching out for me and my bottom. 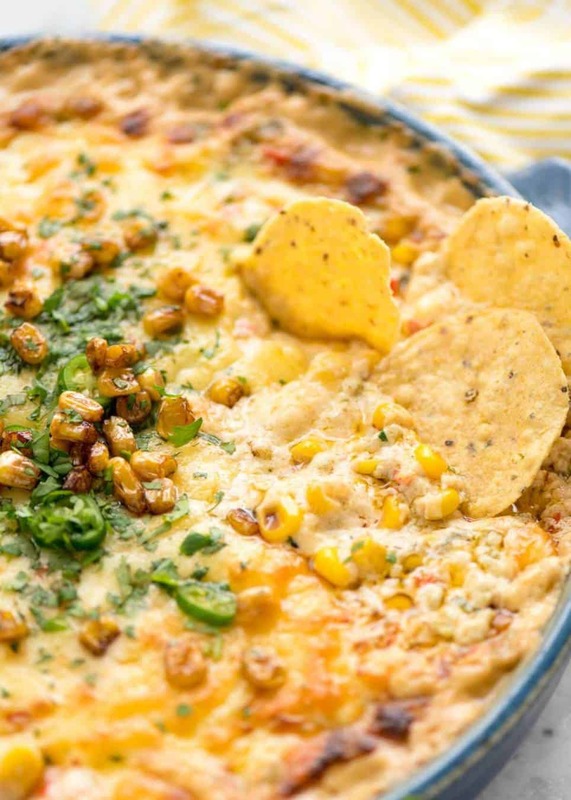 I like making this Hot Corn Dip because it’s a little different to the usual suspects. Nobody ever turned me down when I showed up with a Bacon Dip or everybody’s favourite Spinach Artichoke Dip, and I often get requests for this old school 2 minute French Onion Dip made with packet French Onion Soup Mix (it’s the only way it can be done!). 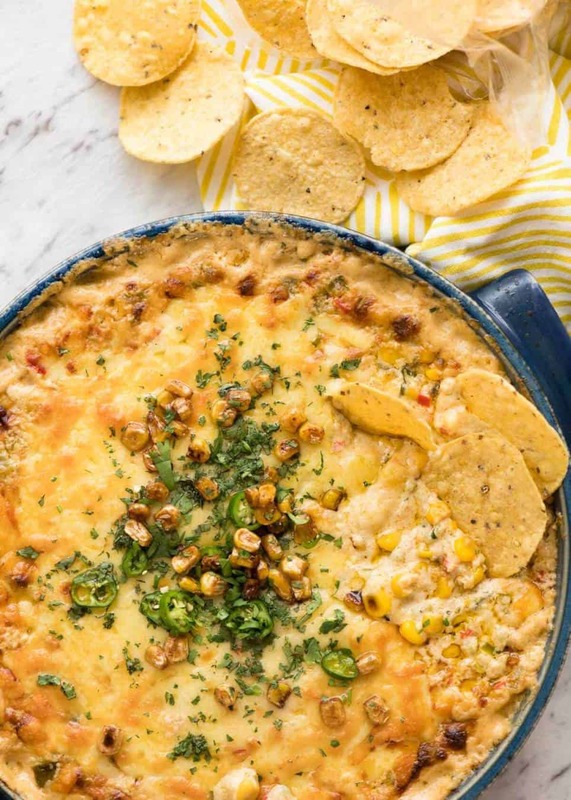 Corn Dip isn’t at the forefront of people’s minds so it’s something a little different, and no one can resist it. Well, let’s be real. Golden corn, cream cheese, more cheese. It’s pretty hard to go wrong! Hot Corn Dip can be made with canned, frozen or fresh corn. 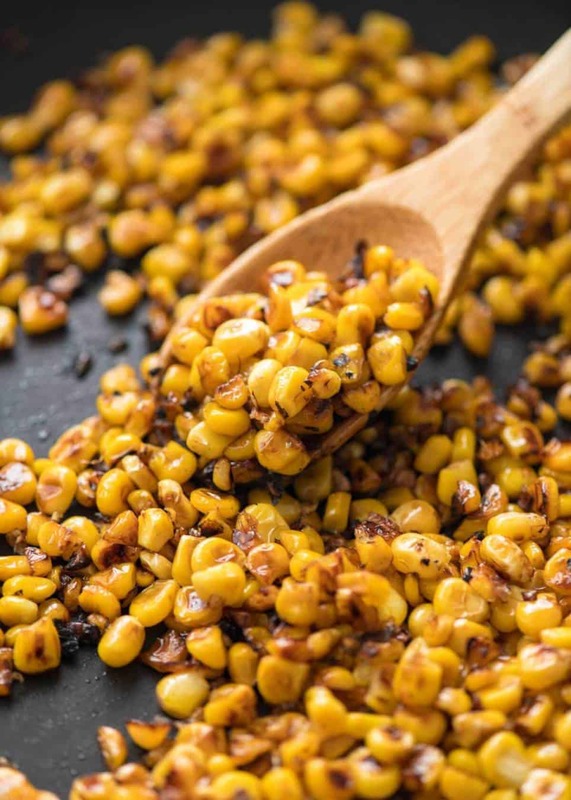 If you want to make it extra special, make the effort to use fresh corn because it browns better when sautéed. And that, my friends, is the secret that makes this the best Corn Dip you’ll ever have!! I mean, even steamed corn is delicious. But when you sauté it until golden, that’s corn in another stratosphere. Something magical happens. It intensifies the corn flavour, the sugar caramelises. So imagine all that amazingness mixed into a creamy, bubbly, cheese Corn Dip!!! In addition to the corn, we’ve got all sorts of other flavourings in this. Red and green capsicum / peppers, garlic and onion which is sautéed in butter. Canned green chillies (I love the smokiness it adds! ), jalapeño for a subtle kick (totally optional), and green onion for some freshness. For the creaminess, I like to use a combination of cream cheese, sour cream and mayonnaise. I find that this combination provides the best texture (dippable without chips breaking but not too loose) and flavour (thanks to the mayo!). 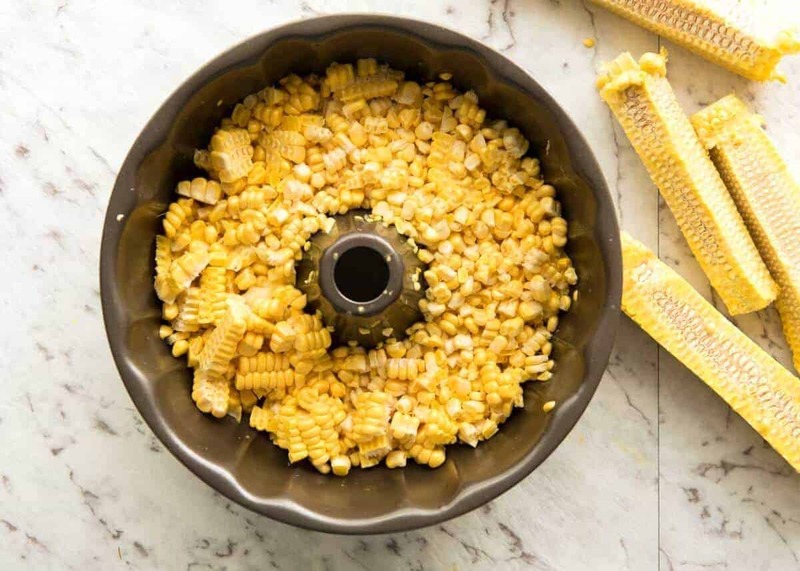 Here’s a quick tip to stop the corn kernels flying everywhere when you cut it off the cob: either use a bundt pan or a ramekin in a bowl, stand the corn on it then cut the kernels off. The kernels will fall into the bowl our bundt pan. I contemplated adding bacon into this. But you know what? It doesn’t need it. The corn really carries it, and you’ve got all sorts of other flavours happening in this dip too. Bacon would add even more flavour but it will also mean you will taste less of what’s already in this and might possibly even overpower it. And it would be such a shame to overpower the gorgeous corn flavour. Recipe video above. Bubbly, creamy and bursting with flavour! The secret that makes this so good is to saute the corn! Serve with corn chips, crackers or even veggie sticks. Cut the corn off the cob. Tip: Use bundt pan or ramekin. in large bowl, see video. 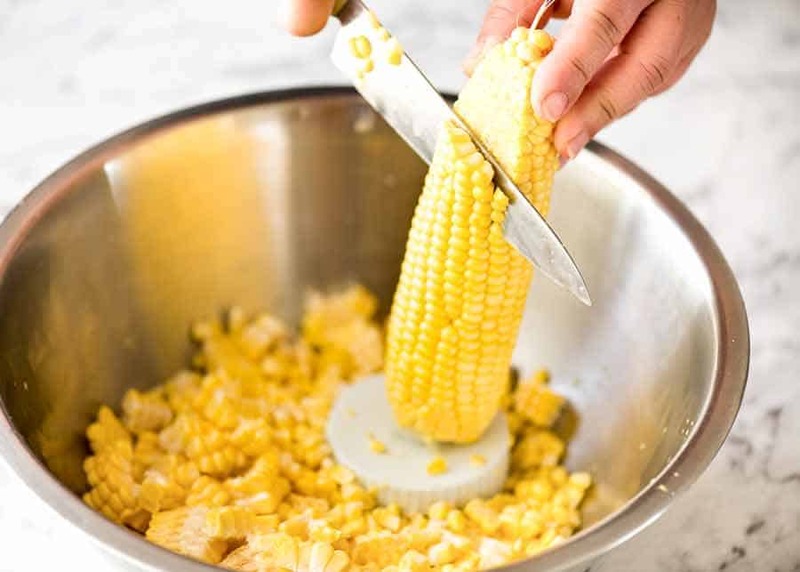 If using frozen corn, no need to thaw. Melt 1 tbsp butter then add 2 tsp oil in a skillet over high heat. Add half the corn and half the garlic. Cook, stirring (or tossing!) for 3 minutes or until corn is golden (golden = better flavour). Transfer corn to bowl, repeat with remaining corn. If the skillet looks dry, add a touch of oil. Add both capsicums and onion, cook for 2 minutes until softened. Add to bowl with corn. Add half the cheese into the bowl, then all the remaining ingredients. Mix, transfer to baking dish. Top with remaining cheese. 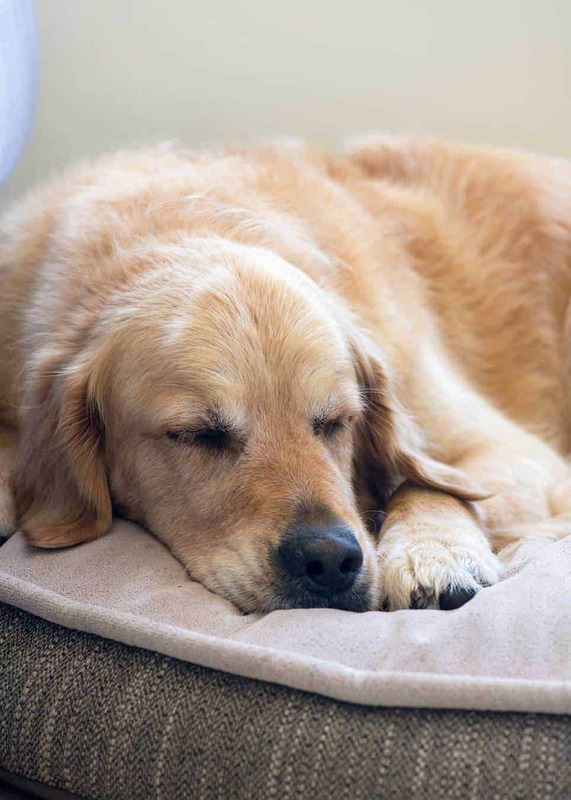 Bake 30 minutes or until golden and bubbly on top. Top with garnishes if desired. Serve hot with corn chips! 1. 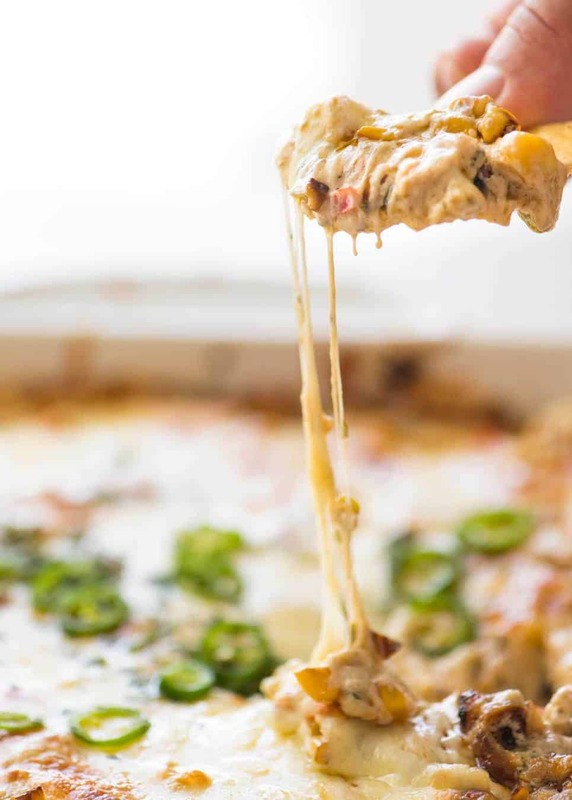 Monterey Jack is my favourite cheese to use in this dip, but is sadly not always accessible here in Australia (Harris Farms, please bring it back permanently!!!). So I usually use cheddar, or tasty cheese (an Australia cheese). Pepper Jack, Gruyere, Provolone and Swiss would also be terrific. Mozzarella is great for the topping but I don’t feel it has enough flavour for the stir through, but it will work just fine if that’s all you have. 2. Chopped Canned Green Chillies are sadly not standard stock in Australia supermarkets. I bring back dozens and dozens of cans every time I go to the states. The chilli is not spicy, it tastes more like charred green capsicum / bell peppers. I love the mild smokey flavour that it adds to this dip. The best substitute is to skip the fresh red capsicum and replace it with 260g chargrilled capsicum, drained and chopped. This will yield a very similar end result. Otherwise, just skip the green chillies and I absolutely promise you that this is still a ripper of a dip that everyone will scoff down! 3. 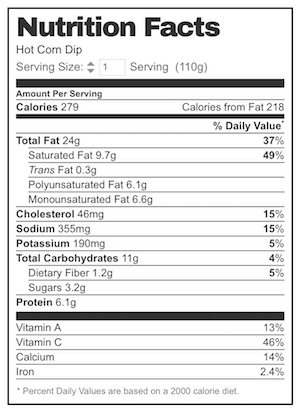 Nutrition per person, assuming 15 servings. You can’t imagine the stench coming off him. 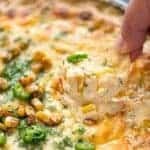 The post Hot Corn Dip appeared first on RecipeTin Eats.